For power upgrades to 400BHP the engine is essentially a comprehensively rebuilt standard unit, with the additional feature of having the cylinder head ports lightly ported to blend the valve seat inserts with the ports, multi angle valve seats, and the addition of a WRC steel head gasket instead of the original composite item. We build these engines at the std 8.0:1 compression ratio, and can include extra options such as a big wing gated sump should you wish to do any track use. Block chemically cleaned, rebored and deck face machined to make flat, mains line honed if required, block repainted in “NMS Blue”. Crankshaft reground and balanced as necessary, new bearings, oil pump, water pump and gaskets throughout. New pistons (usually Mahle), std con rods reconditioned, with re-sized big ends, new little end bushes and ARP rod bolts. Cylinder head fully overhauled, with refaced and refurbished valves, new bronze valve guides, multi angle valve seats, dressed ports, face diamond milled, new INA followers, cam belt, tensioner, new exhaust studs (head helicoiled if required), washers and nuts, WRC head gasket, cam cover refurbished in your colour and re-milled. We recommend the use of the std inlet manifold (2wd or 4X4) and our T04B hybrid turbo on this unit, but is also an ideal engine for any T3/T34 turbo. 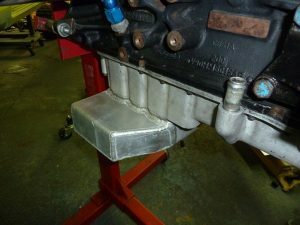 For 450BHP the engine comprise of all the work for the 400bhp unit, but with the addition of our Stage 1 cylinder head. This consists of a ported head with optimised ports for maximum flow while maintaining low down torque. This engine is usually fitted with our uprated inlet camshaft. 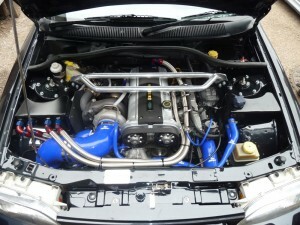 The std 4X4 inlet manifold is used with either a T38 turbo or a GT3071r turbo.